Current map matching algorithms suffer the problem that matching accuracy and matching efficiency cannot be achieved both in the face of massive floating car data. 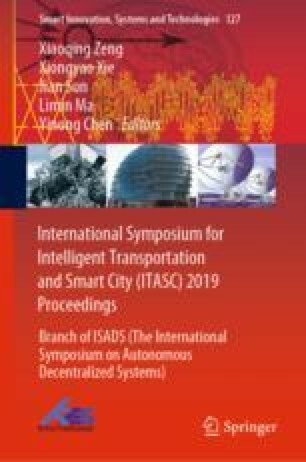 A novel map matching algorithm combining twice gridding and weighting factors methods has been proposed in this study, selection of candidate road segments and determination of the shortest path are based on twice gridding method; Factors of driving direction and trajectory angle are served as improvement of weighting factors method, and matching accuracy rate in specific situations such as parallel road segments, intersection areas, intensive road segments and large positioning errors has been improved. Meanwhile, to avoid driving direction and trajectory angle failing at low speeds, which results in interference problems with map matching, the weights of driving directions and trajectory angle are dynamically adjusted by instantaneous speed and interval length between the trajectories. Through map matching case study of actual data, results show that the improved weighting factors method in this study performs outstandingly in improving the matching accuracy rate, and combining the method of twice gridding effectively improves matching efficiency in principle, which makes the map matching algorithm in this study can balance the matching accuracy and matching efficiency well when facing massive floating car data.